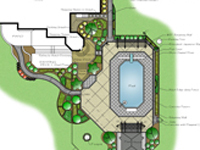 Our landscape architects and designers provide all facets of landscape architectural design. We specialize in landscape master planning, site planning, formal and natural gardens, outdoor entertainment areas, swimming pool gardens and many other facets of landscape design. "Biafore was able to help with the planning and layout by suggesting alternates that would enhance the overall effect and long term usefullness of the landscape design. We feel that Biafore Landscape Development was and would be an asset to any project looking for a professional and innovative contractor to perform as well as design a lasting impression"